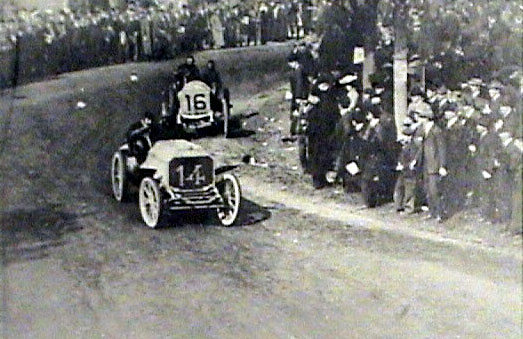 Only four drivers particpated in half of the six Vanderbilt Cup Races held on Long Island; Herb Lytle (1904, 1905, and 1908), William Luttgen (1904, 1906,and 1908), Joe Tracy (1904, 1905, and 1906) and a driver whose name would become one of the most famous brands in American car history- Louis Chevrolet. Known for his daring, fearless and, sometimes. reckless racing style, Chevrolet's driving would also be one of the reasons the races would leave Long Island. But, let's start at the beginning. Born Christmas day 1878 in La Chaux de Fonds, Switzerland, the son of watch maker Joseph Félicien Chevrolet, he learned the intricacies of machinery at a young age. When he was nine, the family moved to Beaune, France. In the 1890’s Chevrolet jumped into the burgeoning bicycle market. 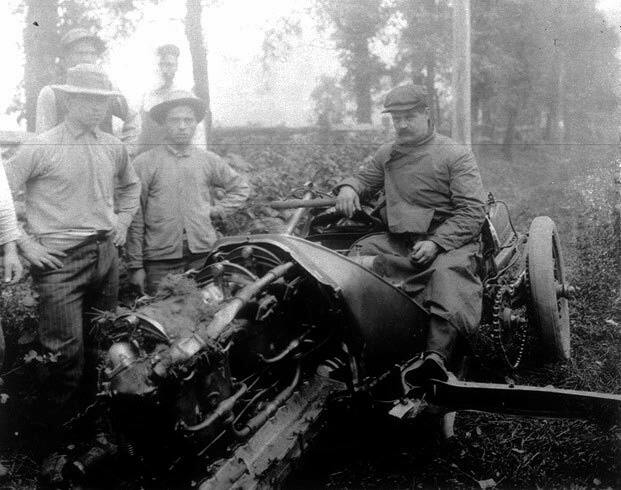 He raced and built the popular mechanized vehicles. This proved good training for his progression into the new market for automobiles. France was the hotbed of automobile companies and Louis worked for Mors, Darracq, Hotchkiss and de Dion Bouton as a mechanical engineer. In 1900 Chevrolet immigrated to Montreal to ply his skills in the North American automobile industry. After a stint as a chauffeur, he moved to New York to work for de Dion. By 1902 he began working at New York Fiat importer Hollander and Tangeman. Chevrolet impressed and was given a racing opportunity. He quickly rose to fame by defeating Barney Oldfield in his very first race held at Morris Park, New York on May 20, 1905. For the previous three years Oldfield had been crowned by the press as the king of American track racing.To Oldfield it must have seemed this brutish-looking 26-year-old parachuted out of nowhere and into the seat of Major Charles Miller’s 90-HP Fiat. This development shocked railbirds as Oldfield was established as the nonpareil of horse track venues. 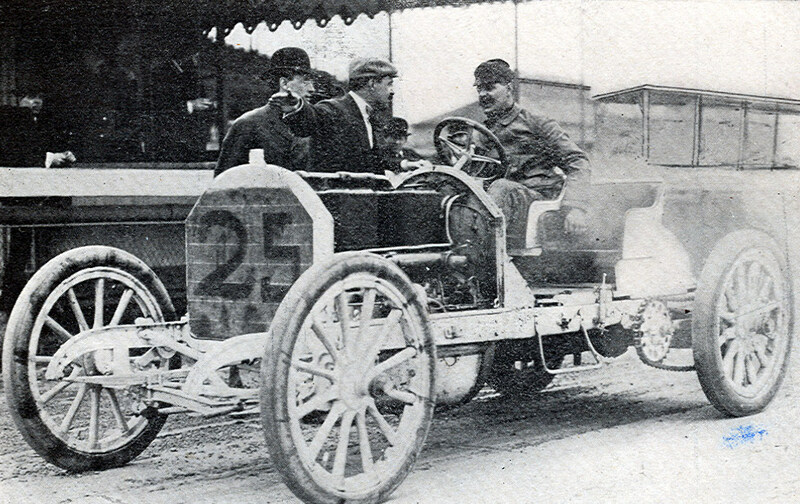 When Hollander and Tangeman offered him a 110-horsepower Fiat for a crack at the 1905 Vanderbilt Cup Race, Chevrolet was eager to see how fast it could go. Too eager, as the machine was reduced to a heap of twisted metal by the Monday morning before the Saturday, October 14th race during a practice run. His enthusiasm frequently exceeded his judgment and despite a blinding fog, he had rocketed full tilt over the crushed stone roads to clobber a telegraph pole lining the course. A photographer capture the gloom Chevrolet after the crash. 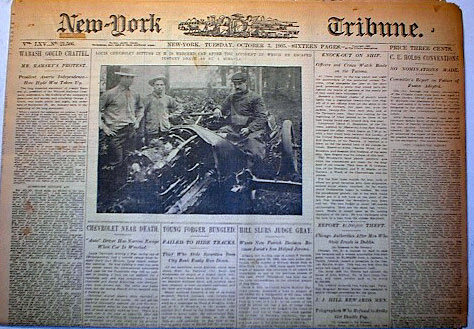 The New-York Tribune published the photo on its front page and declared "Chevrolet Near Death". Miraculously, he emerged with hardly a bruise. Undaunted, Chevrolet returned with 90-HP backup car in the Vanderbilt Cup Race. Here, he can be seen battling George Heath's Panhard at the New Hyde Park Turn on to Jericho Turnpike. 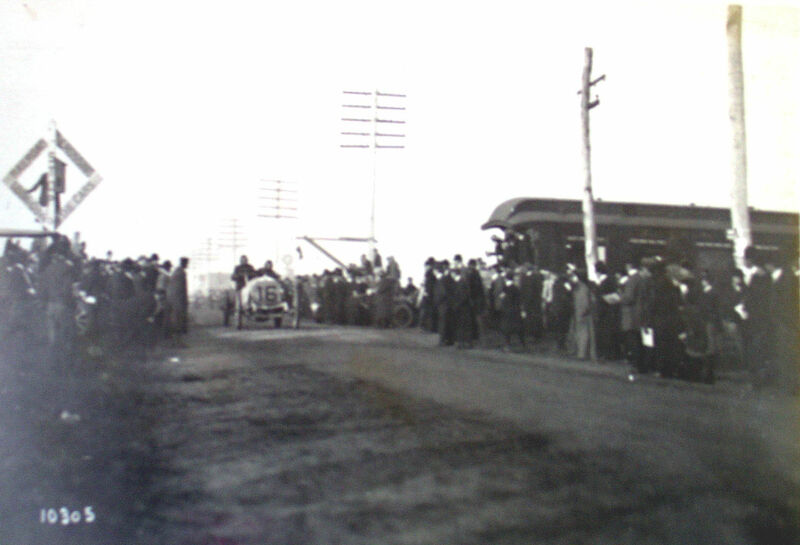 During lap 4 at the railroad crossing in Mineola, Chevrolet was running in fourth place. However, during lap 7 Chevrolet slammed into another telegraph pole on Willis Avenue in Albertson ending his run. He would finish 10th of the 18 entrants.